Are you browsing this page on Google Chrome right now? Well, you're going to want to. Some saint of a coder has developed an utterly delightful hack that rolls up all of a Web page's text and pictures, Katamari-style. Did we mention there's a multiplayer feature? 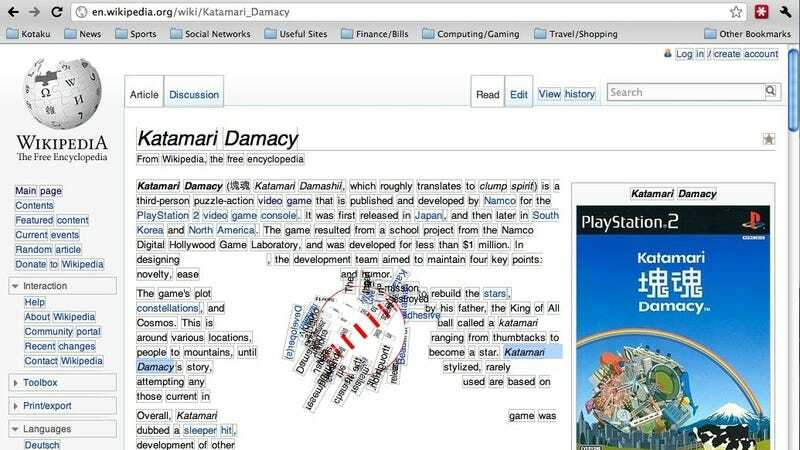 By going to the Katamari Hack Web site and pasting in a URL, you create a game session (listed on that site) which allows other people to join in. GamePro, which spotted the hack yesterday, noted that the creator "has seemingly taken great pains to remain anonymous." The page was originally hosted on an anonymous Amazon Web Services site. He seems to be out in the open now, as the code has moved to the URL kathack.com, whose owner, a Seattle programmer, is identifiable by a WHOIS lookup.